Martinez said nine other persons were riders, four of which received minor injuries and were given treatment by an Española physician. Me and my, uh, mother and father and a grandmother and a grandfather were driving through the desert, at dawn, and a truckload of Indian workers had either hit another car, or just — I don’t know what happened — but there were Indians scattered all over the highway, bleeding to death. So the car pulls up and stops. That was the first time I tasted fear. I must have been about 4 — like a child is like a flower, his head is just floating in the breeze, man. The reaction I get now thinking about it, looking back — is that the souls of the ghosts of those dead Indians ... maybe one or two of em ... were just running around freaking out, and just leaped into my soul. And they’re still in there. 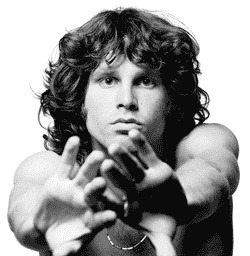 Those familiar with the history and mythology of The Doors singer Jim Morrison know his story about seeing the accident. “Indians scattered on dawn’s highway bleeding/Ghosts crowd the young child’s fragile eggshell mind,” Morrison recites on his song “Peace Frog.” In the 1991 movie The Doors, Oliver Stone turns this incident into a recurring motif. The accident victim, played by Floyd Red Crow Westerman, is a mystical shaman whose spirit tries to guide Morrison through his troubled life. But if what Durham has uncovered is true, Morrison’s childhood memory of the wreck on the highway is not quite accurate. In fact, even though that stretch of road runs through Pueblo land, the “Indians scattered” might not have been Indians at all. Durham, who earns a living as a fundraiser for a high-school sports team, believes that seeing this wreck was a turning point in Morrison’s life, making an impression on his young mind that helped lead to his life as a poet — a death-obsessed poet many would say — a musician, and something of a shamanic figure himself. As if he, too, were touched by some mystic spirit guide, Durham set out to research the accident. 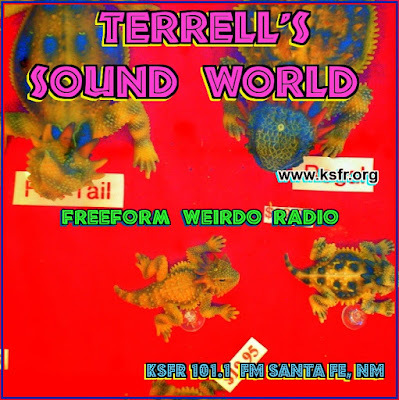 He’s read countless biographies of Morrison and The Doors (I saw about 20 books on the singer in Durham’s motel room in Santa Fe when I recently spoke with him). He’s interviewed Morrison’s friends, including Frank Lisciandro, whose recording of Morrison’s account of the incident appears on the album An American Prayer. And he’s spent hours at the New Mexico Commission of Pubic Records office poring over newspaper accounts of highway wrecks that happened during the short time the Morrison family lived in New Mexico. 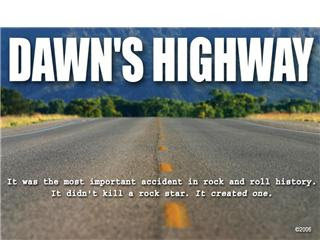 Durham’s research forms the basis for his documentary Dawn’s Highway. He hasn’t completed it yet; he was recently filming at the accident site. As Durham discovered, Morrison’s father, George Stephen Morrison, a U.S. Navy officer who eventually became an admiral, worked in Albuquerque at the Sandia and Kirtland bases from February 1947 to February 1948. Jim was 3 when the Morrisons moved to New Mexico; they lived on Williams Street near the downtown area. The family moved to Mountain View, Calif., in 1948 when George Morrison was reassigned. They returned to Albuquerque in 1955, where Jim attended seventh and eight grades at Monroe Junior High School. Durham (pictured at right, at the spot where he believes the accident took place) has not proved beyond all doubt that the N.M. 30 wreck is the one that young Morrison saw. He has not been able to locate the accident report for the San Ildefonso crash. Peter Olson of New Mexico’s Department of Public Safety said fatal-accident reports are kept for up to 20 years, so there’s no known record of the Morrisons being at the scene of the accident. “But I challenge anyone to find any other accident that matches this description,” Durham said. The big story on Page 1 of The Santa Fe New Mexican on Oct. 17, 1947, was a boring piece about the state government and highway funds. Apparently there was a lull in the news for a few days. On other days during October 1947, there were some big headlines like “FBI Nets 2 in A-Bomb Threat,” “Arabs Move Troops Along Border to Seal Off Palestine From the World,” and stories about Reds infiltrating Hollywood. But near the bottom of Page 1 on Oct. 17 was a headline: “Mishaps Take Two Victims Over State.” The report was from that morning (The New Mexican was an afternoon paper back then): “Bacilio Quintana, who is survived by his wife and seven children, died as a result of a broken neck. The officer said an inquest may be held some time today either in Española or Santa Fe.” (The paper misspelled Quintana’s first name twice in the story. His name was "Basilio," Durham learned.) Quintana was about to retire as a janitor at Los Alamos National Laboratory, Durham said. The next day, the paper reported that the inquest for the San Ildefonso wreck did occur. It was revealed that the accident happened because a commercial bus apparently struck Tony Montoya’s converted truck while trying to pass it in a no-passing zone. Bus driver Ruben F. Vasquez of Chamisal said he was trying to pass the other vehicle, which he said swerved to the left. The paper also reported that Ernesto Montoya, father of the truck driver, had suffered a fractured skull in the accident and was hospitalized. Durham has located Tony Montoya, now 80, as well as Montoya’s friend Willie Quintana, 75, of San Pedro (no relation to Basilio), who went to the scene of the accident soon after it happened. “They were scattered all over,” is how Willie Quintana described the scene to Durham. Quintana is not familiar with Morrison or Doors lore, Durham said. Basilio Quintana did not consider himself an Indian, Durham said. He was Hispanic and living in the village of San Pedro. State historian Estevan Rael-Gálvez, who has helped Durham with his film, said he can see how people not familiar with New Mexico’s cultures might believe they saw Indians at the crash when they really saw Hispanics. “Identity is a complex thing,” he said. One big question is why the Morrison family, living in Albuquerque, would have been traveling along a two-lane highway south of Española. Durham said he has no definitive answer to that. 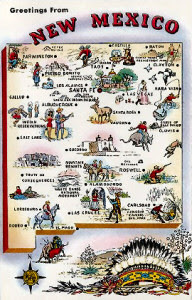 As it does now, tourist literature of the ’40s encouraged people to visit Indian pueblos. The road goes through San Ildefonso and Santa Clara pueblos and affords a great view of Black Mesa — considered sacred by Pueblo Indians — and also offers a chance to see Otowi Bridge, one of three suspension bridges in the state at the time. Surprisingly, The Doors aren’t even his favorite band. That would be The Who. But Durham said he’s fascinated by the things that shape the minds of the artists he loves, the events that lead artists to find their creativity. In the case of Morrison, Durham said, that event occurred on a lonesome road in the shadow of Black Mesa.